After failing to complete the full 11 garment SWAP Timmel Fabrics competition what with getting engaged and starting a new job etc, I have decided to have a go at this one. 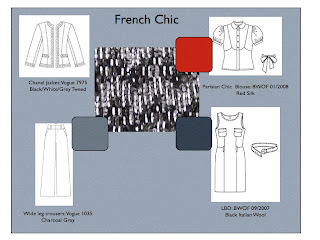 I was so impressed with all the Chanel Jackets that people have made that I really wanted to complete one and the fabric is a gorgeous tweed from Linton Tweeds in Carlisle which still supply Chanel and many others with fabric. I am currently trying to fit my muslin of Vogue 7975 because I want it to be quite fitted rather than boxy. To go with it, I am going to make some charcoal grey trousers (more about this pattern later!) and an LBD. I really love this Burda blouse as made by Christina and Laura. My only concern with the blouse is that it won't work under the jacket so this might get changed for another one. What on earth is an LBD?? I really like your pattern choices. I'm looking forward to your progress.